Is there any better way to raise someone’s spirits other than A bouquet of flowers? Flowers have a way of breathing life into a dull mood and shining light on our inner darkness. 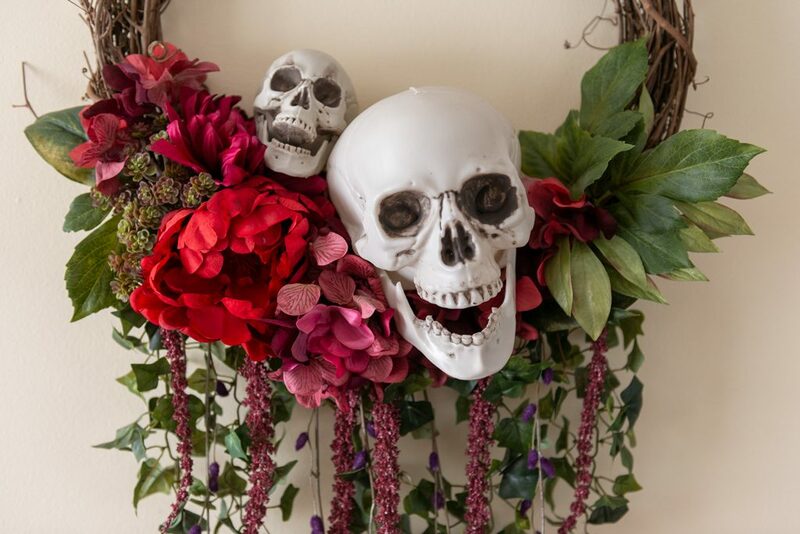 So we got to thinking, what a better way to liven the spirits of Halloween than with a burst of blooms? 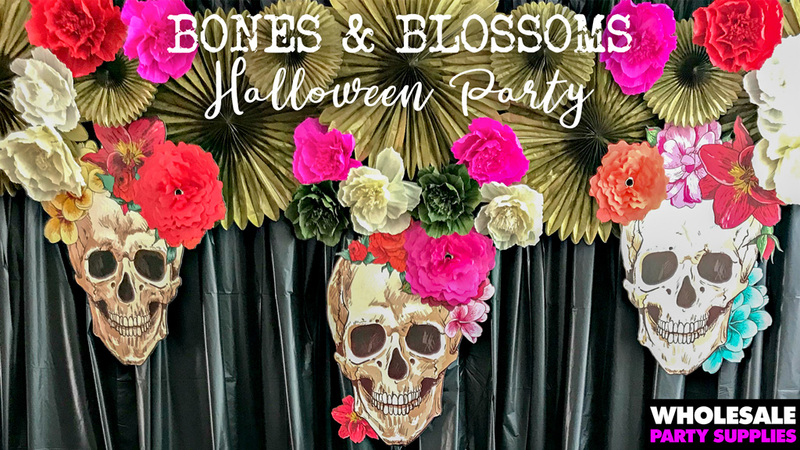 We wanted to keep up the spooky factor, so we picked up a few skulls to pair with a variety of blooms to coordinate with our Bones and Bloosoms HalloweenParty. 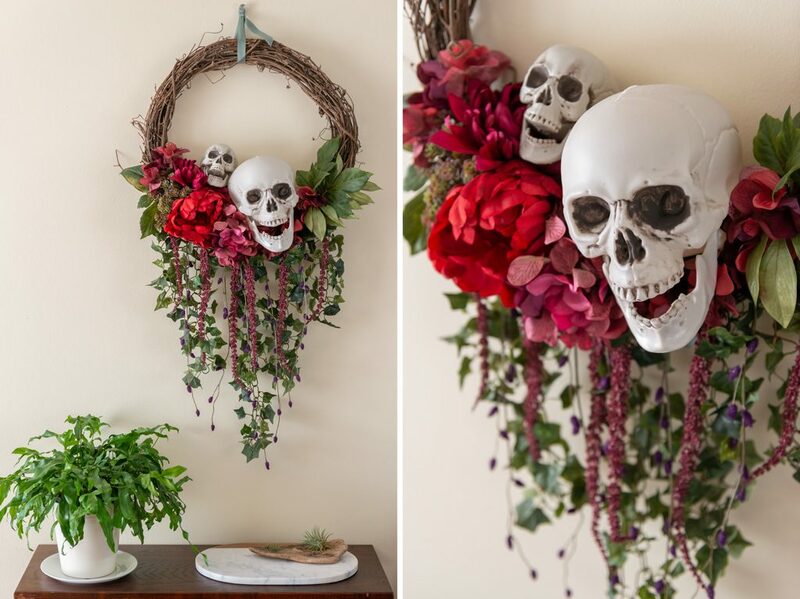 This wreath will look great hanging on the entrance or indoors. 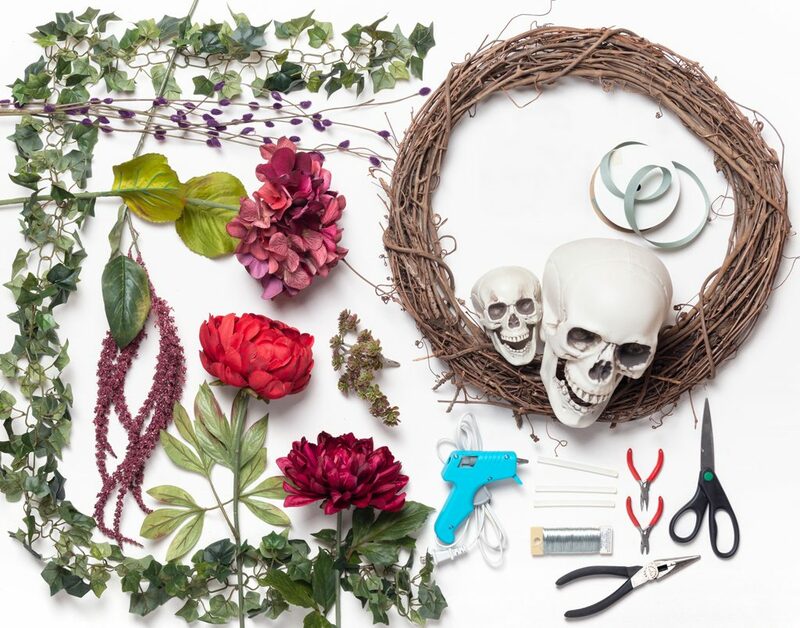 Follow along with our instructions to find out how to bring this wreath to life. Bones and Blossoms Wreath Supplies. 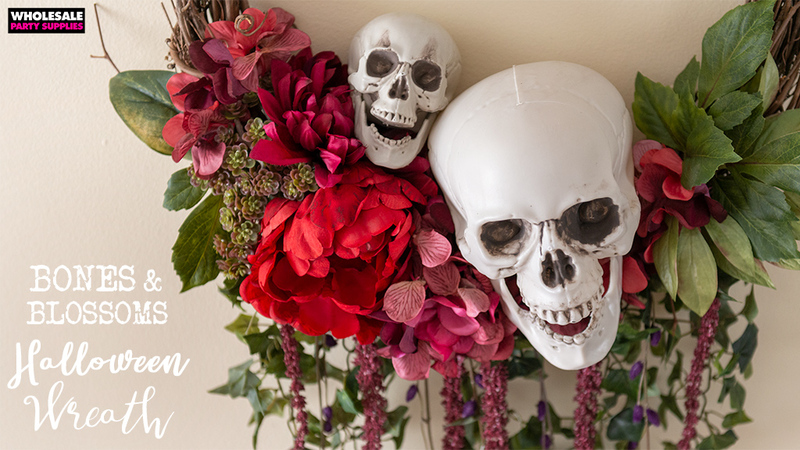 We chose flowers and ribbon in colors to coordinate with this awesome floral skull tableware but you can choose flowers and ribbon to match your decor. 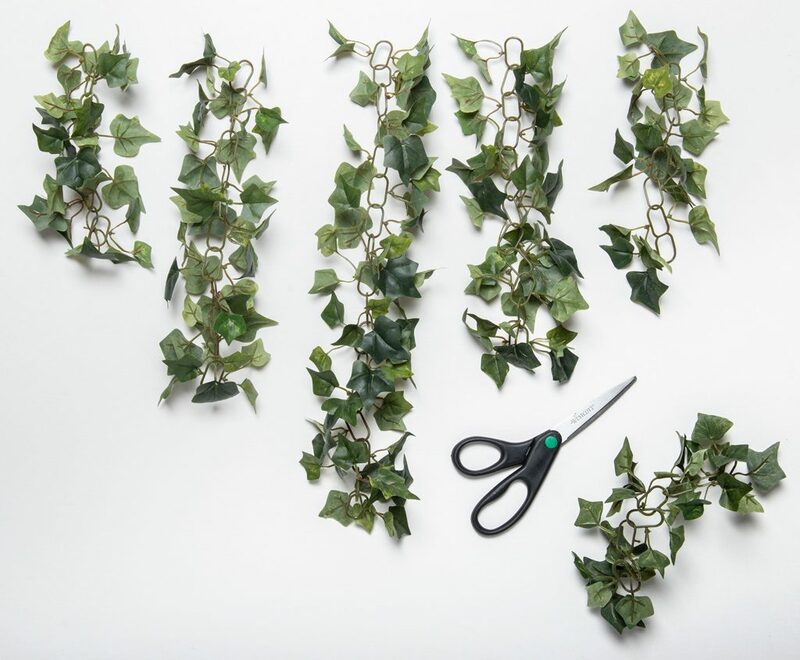 Trim the ivy garland into five pieces. The longest piece has 17 links, the shorter adjacent pieces have 12 links each and the 2 short pieces have 8 links each. We had some leftover. Cut the droopy flowers off of their stems. You might need the wire cutter for this. The hydrangea blossom is so big we can cut off a few of the excess flowers to use later. We cut the five flowers from the base of the cluster. Pull the leaves off of all the stems and set aside. Use the wire cutters to remove the blossoms from the stems. Leave about a 1.5″ of stem on each flower. 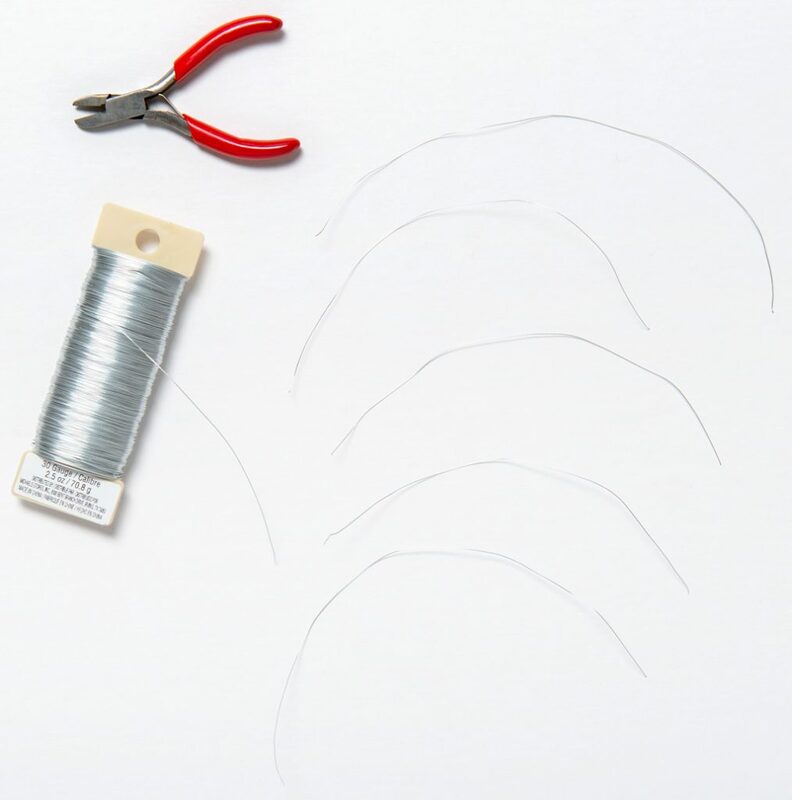 Prepare 11 small pieces of wire about 4-5″ long. Also cut one piece of wire about 12″ long. In the bottom center of the wreath form loop a small piece of wire through a few vines. Loop one end of the wire through the longest piece of ivy twisting the wire to secure it. 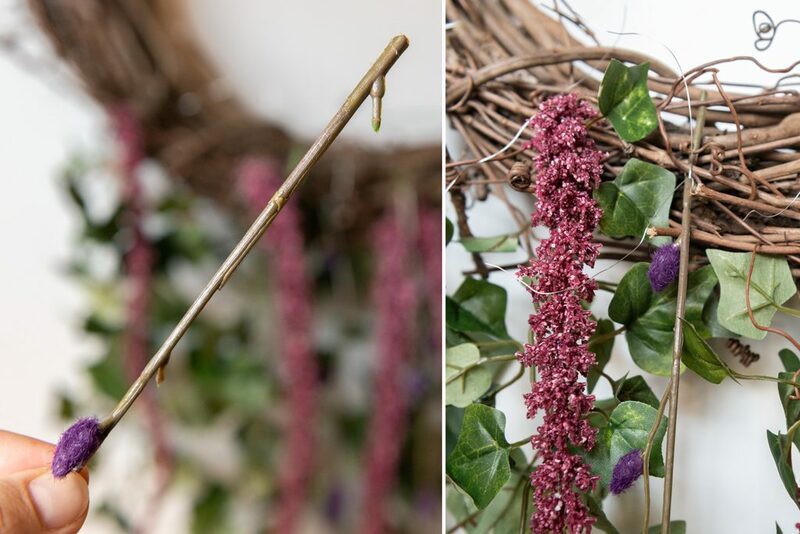 Twist the same wire around the widest end of one of the long droopy flowers on top of the ivy. Continue adding the rest of the ivy and flowers leaving a bit of space between each piece. Our other droopy flowers were too straight and smooth for the wire to hold securely. We pulled off one of the buds so the wire could hold the stem in the notch. Secure the stem and 3 others in the space between the ivy. 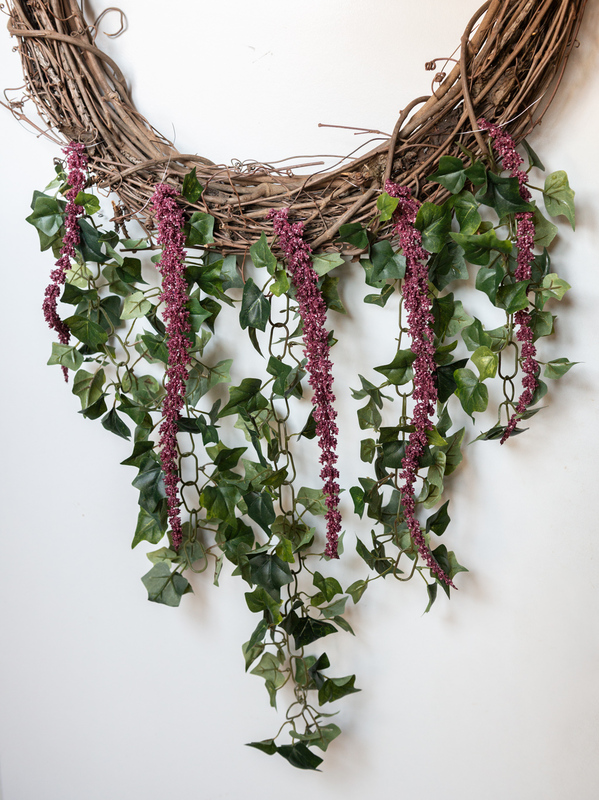 Arrange the large blossoms and a succulent sprig on the wreath but weaving the stem into the vines. Fill in the empty space with the extra hydrangea blooms that were set aside. For extra security use the hot glue gun to secure the flowers to the wreath. 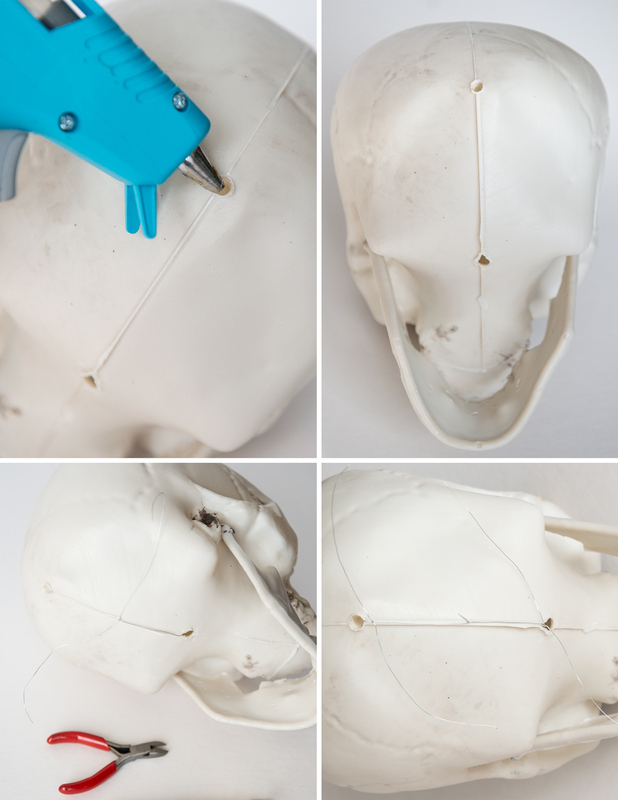 Use the hot glue gun to melt holes in the bottom of the skull. Guide the 12″ piece of pre-cut wire through the holes and twist tie it tightly. Trim the excess. Twist tie two of the small pieces of wire onto the wire you looped through the skull. 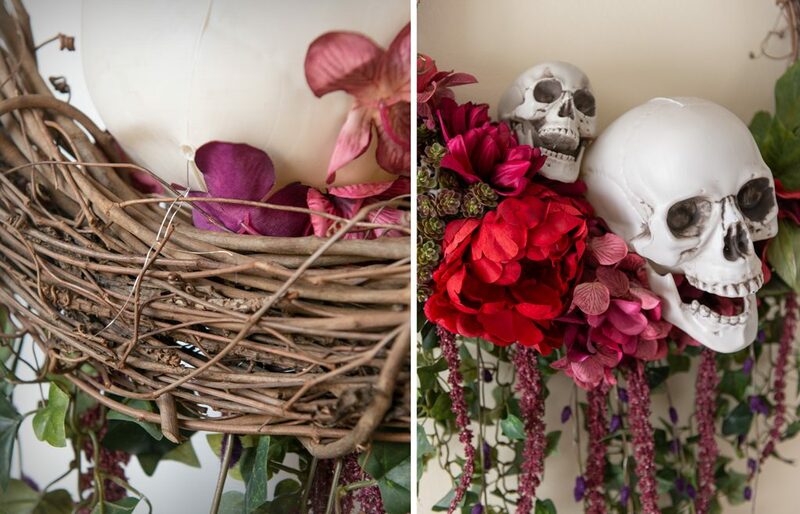 Use both small pieces of wire to attach the skull to the wreath- one wire to the rear and one wire to the front for added security. Nestle the small skull alongside the large skull and use hot glue to secure it in place. 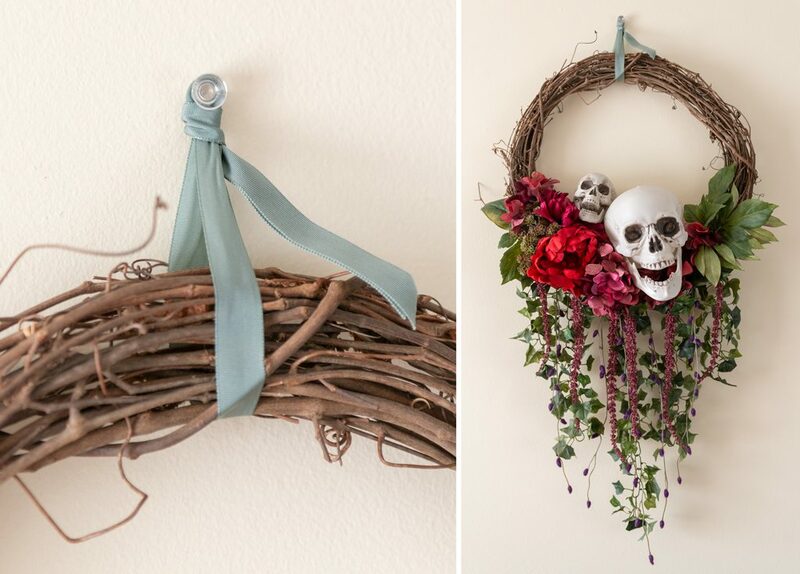 Cut a piece of ribbon to use for hanging the wreath, and hang on a door or wall. Fear not, you ACTUALLY CAN prepare for Halloween without the typical orange and black color palette. 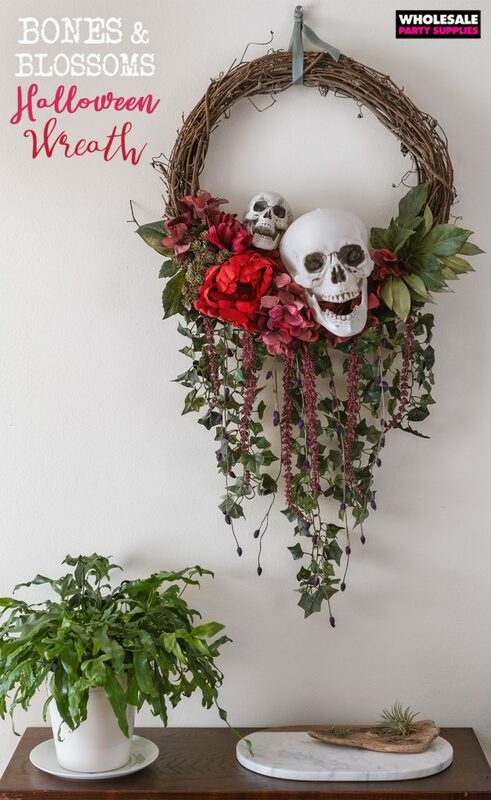 It’s not easy to blend Halloween decorations in with the everyday decor, but this wreath makes it easy.